As a native Nuevomexicana born in Albuquerque, Tey moved back to New Mexico to pursue her graduate degrees after moving around a lot and a long career in retail. Her parents met at UNM when they were graduate students in the Iberian and Latin American Studies programs, and are accomplished Latin Americanists. "I am so proud of them and have learned so much from them. Some might say that LAS is in the blood. I think it might be!" Tey traveled in Mexico and Peru when she was young, even living in Lima for nearly a year. She has family in both countries and feels very connected. Additionally, she considers the LAS program at UNM to be the preeminent of its kind. "I don't think I would be where I am today without the LAS program. I might still be in retail management if it hadn't been for LAS. I love the interdisciplinary components of LAS at UNM; I have always been interdisciplinary, but LAS gave me the training and the confidence to be so in academia." Tey concentrated in Art History and History while earning her Ph.D. Her first job after completing her dissertation was as Curator of Hispanic and Latino collections at the Museum of International Folk Art in Santa Fe. 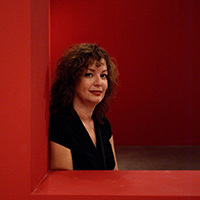 As Director and Chief Curator at the NHCC, she oversees all components of the NHCC Art Museum. She conceptualizes, plans, curates, and creates art exhibitions that fall into the NHCC's mission. "This can be anything from New Mexican works, to Afro- Brazilian artists to Chilean arpilleras. I love art and visual culture and I love to tell the stories of the artists who create these works. For me, art does not come alive until you know the artists." Update as of 12/2016: Tey has been appointed by President Obama to the National Museum and Library Services Board.